Berlin had three major airports: Tegel, Tempelhof, and Schönefeld. However in October 2008, all operations at Templehof Airport was closed due to its unprofitability. Flights from the United States and other European countries land at Tegel Airport which is approximately 8 kilometers (5 miles) northwest of the city. By bus -- the cheapest way into town -- travel time is about half an hour to the city center. Airport buses leave at 10-minute intervals. You can reach the western city centre from the airport conveniently within 15 minutes. Facilities Tegel Airport Facilities include banks, bureaux de change, ATMs, a post office, business centres and baby rooms. There are several shops, including duty-free. Disabled facilities are good; travellers with special needs should contact their airline in advance. Overall a good standard of customer service inspite of its projected closure in October 2011. Bus services are x9, 128 and 109 which operate several times an hour and go to Bahnhof Zoo West Berlin. Apart from these, the JetExpressBus TXL connects the airport to the main train station Hauptbahnhof. The Expressbus X9 leaves from the train station Zoologischer Garten. The Expressbuses stop only at the main bus stops and are therefore a quick connection.The bus or undergound ticket costs € 2.10 (fair zone AB), or € 2.80 for trips to the surrounding. Schönefeld - The former East Berlin airport southeast of the city center is the base for most low-cost airlines and charter flights in addition to traffic from Eastern Europe. The airport is served by the S-Bahn and regional trains. The S-bahn line (S-9) will take you conveniently to (and through) the city centre via major stations as S Ostbahnhof, S+U Alexanderplatz, S Hauptbahnhof and S+U Zoologischer Garten. In S-Bahn and regional trains between the airport (zone C) and the city (zone A,B), the public transport ticket (zones A,B,C for 2,80 EUR) can be used. 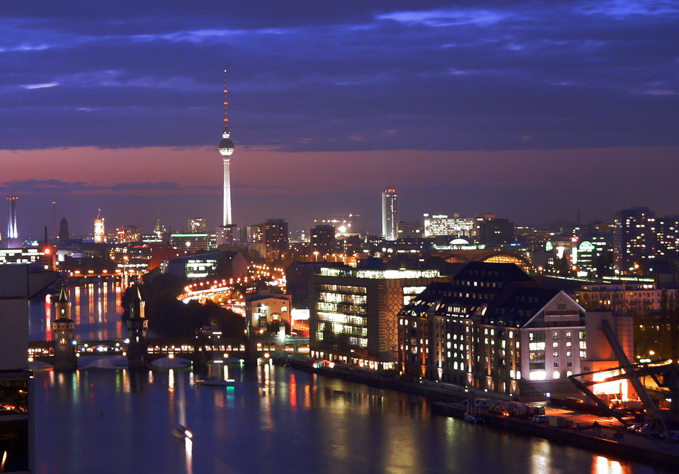 There are numerous direct flight connections between Berlin and major German and European cities. Taxi - There are metered taxis available outside each of the terminals. Taxis wait outside terminal A. To the city centre €30-35/25-40 mins. To Tempelhof airport €25-30/20-30 mins. Bus - There is a bus service that operates from outside each of the terminals to downtown Berlin, and there are two lines that serve the centre of Berlin from the airport. Tickets are valid for 2 hours, and for a trip from Schoenefeld Airport to Berlin city you need zones A, B & C. Using the ticket machines in the airport, first select English, then 'Local Traffic' then Berlin ABC. Cost is €2.80. Tickets must be validated in a special machine before use, and then are valid for 2 hours on buses & trains throughout the city. Train - The train station is not actually in the terminal, but a short (less than 5 mins/300m) walk away along a covered pathway. There is a free shuttle bus that runs to the station every 10 mins 0600-2200, but it is quicker to walk. Children’s Facilities There are baby changing facilities in Terminals A and B. There is a children's playground with toys and video films that is always open and free of charge in Terminal A. There is also a first aid station available in building C 007 and a post office located on the ground floor of terminal A. There are a wide range of shopping oportunites available at the airport in the shopping centre located on the ground floor of both Terminal A and B. The shops offer sweets; photo-goods; pharmaceutical products; newspapers; flowers; toys; and sunglasses. Berlin uses a zone system, but you are unlikely to need to go beyond zone A & B, except on trips to Potsdam or to the Schönefeld Airport (SXF). This is a very large area. The public transport system (U, S-Bahn, bus, tram) uses a common ticket. Standard tickets (€ 2.10 for A & B) are valid for any travel within two hours of validation, in a single direction, within the appropriate fare zones. There is no limit to transfers. For a single journey you can buy a cheap Kurzstrecke for €1.30, but this is only valid for 3 stops on the U-Bahn or S-Bahn (six stops by bus or tram); no transfers are permitted. Berlin has an amazingly efficient S-Bahn, trains run roughly every 10 minutes during daytime, every 5 minutes during rush-hour and every 20 minutes during the night and on weekends. Most S-Bahn lines run on an east-west route between Ostkreuz and Westkreuz via the stops Warschauer Straße, Ostbahnhof, Jannowitzbrücke, Alexanderplatz, Hackescher Markt, Friedrichstraße, Hauptbahnhof, Bellevue, Tiergarten, Zoologischer Garten, Savignyplatz and Charlottenburg. Other lines run along a circle track around the city, most notably the S 8 and the S 41, S 42, S 45, S 46 lines. The Berlin U-Bahn (subway/metro) is something to behold; it is so charmingly precise! All U-Bahn stations now have electronic signs that give the time of the next train, and its direction based on sensors along the lines. Detailed maps can be found in every U-Bahn station and on the trains Together with the S-Bahn, the U-Bahn provides a transportation network throughout greater Berlin that is extremely efficient and fast. During the week there is no U-Bahn or S-Bahn service from appr. 1AM to 4:30AM, but metro trams/buses and special Night Buses (parallel to the U-Bahn line) run every half an hour from 12:30AM to 4:30AM. The most famous bus line, especially for tourists, is bus route 100, which leaves from Zoo Station ("Berlin Zoologischer Garten") or - if you want to go the other way round - Alexanderplatz. 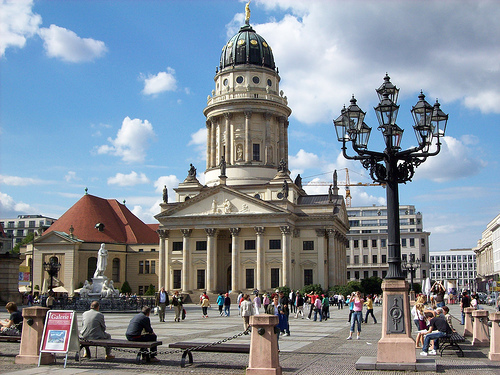 For the price of a city bus ticket or daily pass, it's possible to see many of the landmarks of Berlin from one of the yellow double-decker buses. 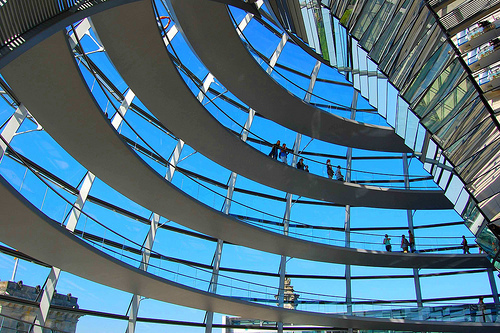 Sit up top as it's easier to see the Reichstag, as well as the many historic buildings on Unter den Linden.